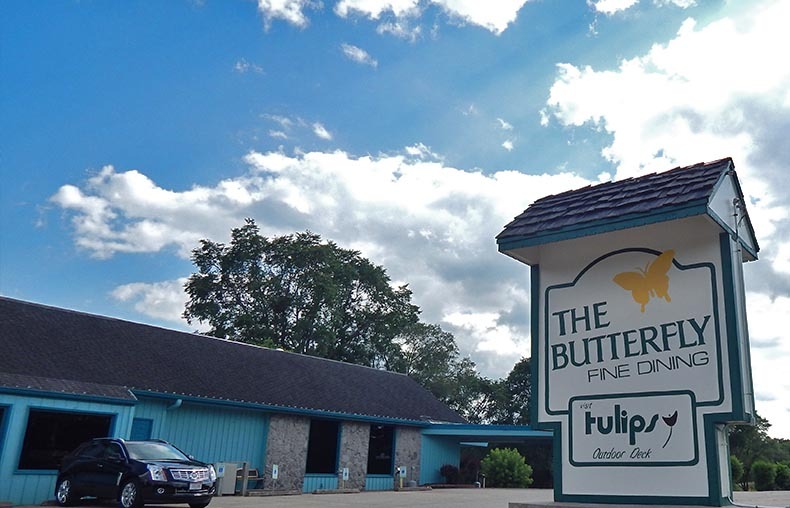 The restaurant’s rich history dates back to 1924, when Hal and Mae Sherburne opened the Butterfly Tea Room, named for the yellow and white butterflies in the nearby field of the Town of Turtle. Over the next several years, the restaurant exchanged many hands, and eventually became known as The Butterfly Club. During the 1950s, a new kitchen, dining room and picturesque cocktail lounge, featuring live entertainment, was built and seating grew to 250. Over the years, the Salas have made updates to brighten décor and tweak the menu. For the most part, however, they’ve relied on The Butterfly Club’s solid reputation to carry the day. It starts with an outstanding menu, which is loaded with many signature items including prime rib and shrimp – an 8-ounce prime rib and three large white Honduran shrimp; Shrimp de jonghe, baked with onions and mushrooms in a pastry shell; and Alaskan king crab legs – a full pound served with butter and steak and shrimp platter. The Butterfly Club offers a Wednesday and Friday night fish fry, as well as a prime rib special on Tuesday and Thursday. “We’re known for our steaks,” Mike says. “And everything we serve is fresh and seasoned to perfection.” The Butterfly Club draws customers from across northern Illinois and southern Wisconsin –Rockford, DeKalb, Madison and Lake Geneva – for dining, as well as relaxing in the spacious cocktail lounge.